Adorable Colin loves to play fetch. This gorgeous Doza luxury dog bed cushion has a spiral fibre inner that will never go lumpy and designer style that will look great in your home. 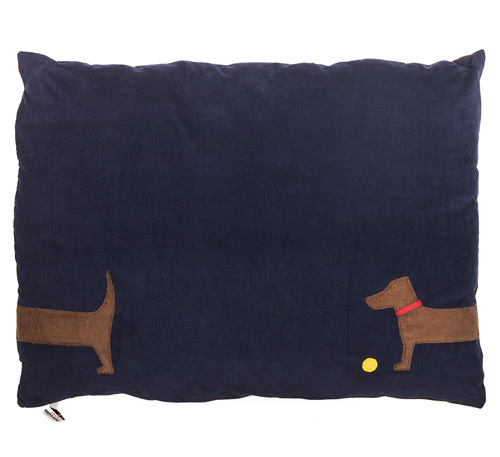 This deluxe cushion dog bed features a navy corduroy top and hand sewn corduroy dog. Creature Clothes Dozas are the ultimate in comfort while bringing a snazzy designer element to your home. The stunning sewn loose outer cover has a strong zip and is filled with 2 separate specially made super squidgy spiral fibre 15 togg duvets that will not become lumpy and bumpy. Both the insides and outer cover is fully machine washable at 40 degrees. 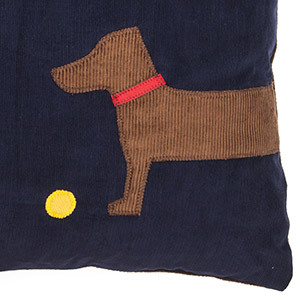 The top of this Doza is a navy corduroy with Colin the dog in brown cord. 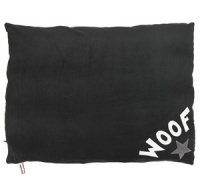 The underside brown polar fleece keeps the warmth in and gives the bonus feature of making the bed double sided. Beautiful, practical and guaranteed to be loved. The ultimate in dog bed chic.